I started having my students create pictures for each of their vocabulary words, and their vocabulary scores jumped immediately. Along with a few other minor tweaks and adjustments, my students–when they do what I ask–perform at a very high level when using new vocabulary words. I included a picture that one of my students created for the word “culmination.” I like this drawing of the word because it simply and directly conveys the word’s meaning without any complex artistic ability needed. The students quickly present their pictures and explain how the definition matches the drawing, and the other students in the class may steal that picture or keep their own. Regardless, the students have a visual representation of the word. 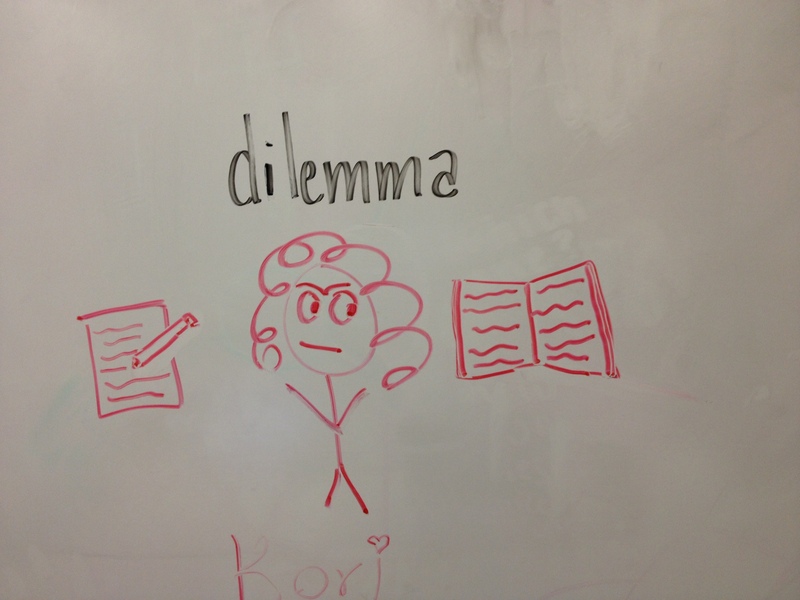 Here is another picture one of my students created for the word “dilemma.” I like this one because the student (with a sly smile) explained that she was trying to decide between finishing her vocabulary homework and her reading, and it was a dilemma since she “wanted to do them both at the same time” because they are the “most important.” This made me laugh because I joke with the kids that English is the most important and should be done first, and I enjoy it when the students joke back with me. Non-linguistic representations are a key component of Marzano’s system of teaching students, and, when my district provided a training on Marzano’s research-based teaching strategies, I felt good about the ways I have my students work. I like routines as well, and the training reinforced my affinity for routines, so my students know which days we will practice vocabulary and when any quizzes might be given. I believe this reduces stress and allows students to feel more comfortable in the classroom. This entry was posted in Lessons, Vocabulary on November 11, 2013 by drpezz. Yep, that’s what I told my students: vocabulary words are all around us. Thus, I said to the kids that I would bet them breakfast that within 10 days I would be able to bring in an example of each word in a pop-culture novel that I’m reading, a magazine I read regularly, or in a newspaper article in a local paper. I used Entertainment Weekly, Robopocalypse (a novel about robots turning on humanity), 11/22/63 (a Stephen King novel about time travel), and The Seattle Times to win the bet. The students were astonished. Then, I challenged them to be honest and look for our vocabulary words in whatever they read whether that be a blog, a comic, a novel, a magazine, a newspaper, or other text. Truly, I did not expect the kids to take up this challenge, but within a week the kids (one class) had found 35 of the 40 words we’d studied so far. J.K. Rowling’s Harry Potter novels provided quite a few of the words, which greatly shocked the students. They realized that I wasn’t lying about the prevalence of these words and that the students often skip over unknown words without looking them up (or even recognizing that they skipped a word!). This entry was posted in Lessons, Vocabulary on October 2, 2013 by drpezz. Using taboo cards from the actual game like the one pictured here, I divide my class into three teams and have them group together. Once in the groups I begin the game, but not by using the actual game rules. I read the first word on the card, which in the normal game is a word that cannot be said when trying to get a player to guess the pink word, and I give the team about 10 seconds to guess the pink word. For example, with the card here I would say, “pouch,” and the students quickly confer and give me a guess. The first word I hear is the guess. If the team gets it right, I award them five points. If they answer incorrectly, I read the second word (in this case it’s “hop”) to the next group. If the second group answers correctly, the team gets four points. If wrong, the third team gets a guess with the third word (in this case it’s “animal”) for three points. The points decrease with each additional clue from 5 to 4 to 3 to 2 to 1. I continue through the five words until a team gets the word correct or no one answers correctly. Once that card is used I put it away and allow the next team to start, and I repeat the process. It’s a blast and really gets the kids thinking and connecting information. I have created my own cards using literature too. However, this sometimes requires a few extra word clues. I either play the game like I did above, or I (more likely) have the students play among themselves in groups using the traditional Taboo rules where the students cannot say the words below the pink word. For The Adventures of Huckleberry Finn (what the students need to guess), I put the words Huck, Tom, Jim, Mississippi River, Pap, Miss Watson, Widow Douglas, King, Duke, and Mark Twain. The students then have to get their teammates to guess the novel title using other words and phrases. It takes a while to make the cards, but it’s fun. I’ve also had students create their own and used them with the other classes. Obviously, this game can be adapted in a number of ways which is part of its appeal. I use it every year, and every years my students enjoy it. This entry was posted in Good Mood, Lessons, Literature, Vocabulary on July 14, 2011 by drpezz. I’m going to use an SAT-prep program with my honors students (which I used last year) along with my non-honors students, and I will use the same successful strategies as in the past. I figure they’re all taking the SAT, so they should all be prepared for it. Plus, I’m going to chart each class’ weekly progress and see how they compare. If all goes well, I’d like to encourage my department to adopt the program for all of our students. This entry was posted in Study, Vocabulary on July 25, 2010 by drpezz. Previously, I posted about a diction analysis assignment I use in class. While I designed it originally for my honors students, I have modified it to use with my mainstream students as well. I thought I would present an example of this here. The first key idea that the kids have to understand is that a diction device is not the same as a literary term. A literary term is a broad category of Language Arts terms while a diction device is a subcategory of literary terms. A diction device focuses solely on word choice, the reasons why authors choose specific words and the subsequent effects (cacophony, euphony, connotation, denotation, dialect, colloquialism, simile, metaphor, symbol, etc.). Even subtle items can be included, especially when an author violates rules of grammar, syntax, or punctuation for effect. Literary terms such as climax, denouement, flashback, and so on focus on plot, not word choice; therefore, I have to focus the students on analyzing word choice (diction). First, the kids have to know the context of the quotation. With this section of text, Charles Darnay has renounced his family’s name and money and left to live in England instead of France. He returns briefly to his uncle’s mansion in France and has a conversation with his uncle, the Marquis, and the disgust of one for the other is evident. The quotation above is the Marquis’ philosophy for keeping the commoners in line. Secondly, the students need to know the definitions of every word in the selected sentence. My students asked about repression (the act of keeping someone/something under control), deference (respect), obedient (willing to comply or to give in to authority), and Marquis (a nobleman ranking below a duke and above an earl or count). I use Dictionary.com right in front of the students to look up the words, so they see me look up words to encourage them to do the same. Here, I wanted to make sure the kids understood the denotation (the primary or most popular definition of a word) of the words, which is a diction device. Connotation is the feeling a person gets from a word. In the sentence from A Tale of Two Cities Charles Dickens used the word “slavery” to show how the Marquis feels about the common people on his land. Because people see slavery as something scary and giving people no rights, this is a word we expect the Marquis to use. The effect of this word is to show the reader that the Marquis does not want to give his people equality. They have to be afraid and poor and always working. This gives the Marquis control. A single sentence incorporated five diction devices! The entire lesson took a period, but it set the groundwork for numerous lessons and deeper insights into the literature and into the careful selection of words. I can use this as an introduction into more literary devices, character analyses, and most importantly the students’ choices about their own diction when speaking and writing. This type of lesson can help students improve their reading, writing, and speaking abilities. P.S. I have the students fit their answers into a specific three-part structure. Next, I have the students identify exactly where in the selected text, they believe the diction device is employed. [Alliteration is used in “dark deference” because the ‘d’ sound repeats in two consecutive words.] Sometimes I make the students use the finger test; they have to put their fingers on the evidence of the diction device. Alliteration is the repetition of consonant sounds in words close together, often at the beginnings of words. Alliteration is used in “dark deference” because the ‘d’ sound repeats in two consecutive words. The effect of this use of alliteration is that the reader is drawn to the phrase “dark deference” (based on the repeated sound) because Dickens wants the reader to see that the Marquis desires obedience from fear and not respect. This entry was posted in Lessons, Literature, Reading, Vocabulary, Writing on November 11, 2009 by drpezz.